Every pragmatic worker would want to know how they can improve their daily productivity. But, did you know that each profession has its own idea to boost productivity may it involve just one person or more. In other words, we can learn from what other professionals around us. Let’s take the web designers and developers as an example. These people conduct stand-up meetings or short meetings with one main goal – to realign priorities. Sometimes, this is all a sales team or salesperson needs to keep things in perspective and, ultimately, boost productivity. And, guess what? Realigning one’s priorities is very easy; all you need is 15 minutes of your time or even less than that. From the name itself, a stand-up meeting is a type of meeting where all attendees participate while standing. The goal is to keep the meeting as short and straightforward as possible. Otherwise, the discomfort of standing up for a longer period will eventually take its toll on the participants. Thus, stand-up meetings are usually timeboxed, occurring between 5 and 15 minutes, and at the same place and period. The meeting will push through even one member, or more are not able to attend. – strengthen commitments from each. Evidently, a stand-up meeting is more of a communication vehicle to encourage the members to speak up and voice their concerns if they have any. In fact, there are two common styles implemented – Scrum and Kanban. These styles intend to know the progress, if the project is progressing at all or not. The only difference is the approach – the approach that you can also apply as a sales team. 1) What obstacles are impeding the team’s progress? 2) In what areas the team has progressed? 1) What did the team accomplish yesterday? 2) What does the team need to accomplish today? 3) What obstacles are impeding the team’s progress? During a stand-up meeting, it would be impractical to limit the discussion on the questions. But, it’s purposive to answer these questions first. Whichever style you choose, throughout the discussion, the sub-topics will reveal themselves anyway through questions and clarifications. Even if not taken in the team setting, the stand-up principle is also applicable to any salesman or saleswoman. You may use either the Kanban or Scrum styles to prioritize what you need to do today and tomorrow. You may do stand-up in the morning you go to work or while at work or do it at the end of the day before you go home. Alternatively, you may want to do a stand-up in the morning and the afternoon so that you can refocus your to-do list. 1) What are the straggling tasks that I left off yesterday and must be completed today? 2) What other things that I must accomplish today? 3) What are my schedules tomorrow that I need to prepare for today? Depending on how you prioritize these, one thing is certain – what you do today will impact what you will be doing or must do the next day. So, make it a habit to stand-up. If you need to revisit your list of to-dos, do so. Just make sure that if isn’t that important, it shouldn’t be on your list or should be least prioritized. If you are not satisfied with how things are going, you may start your after-lunch work with a stand-up. Since you are in the sales department, you’d know how a single call can alter your plans for the rest of the day. So, go over your list of must-dos once more. The goal is to reorganize your thoughts and tasks particularly after being derailed by a distraction. 1) What have I accomplished so far? 2) What should I finish now? 3) What can I do tomorrow instead? On the contrary, if you’ve done all the tasks, the next best thing is to take a particular task in your next day’s to-do list and do it now. That is, if you still have the time to devote to another task. The more spare time you have, the more tasks you can take from the list. This will be revealed with each time you do stand-up. Now, you are seeing the value of doing a personal stand-up. Perhaps, you should do it more often to know if you are on the right track or not. Again, we can learn a lot of things from one another especially the productivity hacks. You just have to be prudent among which of the concepts and principles apply to your profession as a sales representative and which are not. For more productivity hacks and tips, head on to our blog section. 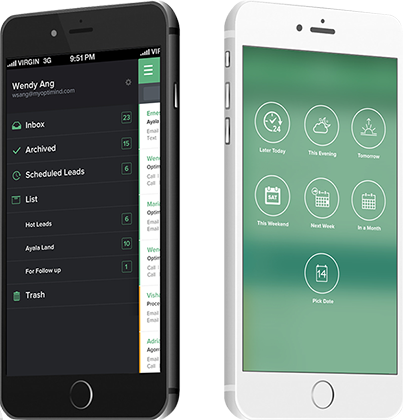 Download our app, Vender App, to make your days more productive.